After Michael Bilow took home a whopping $57,198 on Tuesday, there was some confusion as to where his total stood among the highest single-game scores of all time. Here’s an attempt to rectify that, with a nod to the players who racked up big paydays back when “I’ll take such-and-such for $500, Alex” made sense. Clue values were doubled on November 26, 2001. As such, I’ve doubled the totals of winners who played before then. They’re denoted with an asterisk *. And, yes, I’ll update this on an as-needed basis. Edited: After I published this, Stefan Goodreau pointed out this archived Sony Pictures site, which listed six early high scores not present in the J! Archive. Those scores, all from the $100-$1,000 era, are denoted with a carat ^. Thanks, Stefan! Also: at the request of Robert K S, I’ve marked scores that were unadjusted records at the time with a cross ✝. Note: Bob Blake tied Kevin Frear’s $27,800 record, and Ken Jennings tied Brian Weikle’s $52,000 record three times before breaking it outright. 20 Apr 2015: updated with info about Matt Handel, as pointed out by Stefan based on intel from a trustworthy source. 22 Mar 2016: thanks to Joey Palumbo for sending me this archived page, which lists complete scores for most of the early tournaments. It included the $26,001 pre-doubled haul by Matt Morris in the 1994 Teen Finals. Awesome! If you have the time, the one improvement I think would be neat would be to add a dagger for those who at one time held the No. 1 spot. You might do two different notations, one for those who, like Myron Meyer, held the record absolutely but not relative to doubled-dollar record holders. Elise Beraru’s high score was in 1984, not ’85. And I’ve already told you on Facebook, but I’m putting it here for the general public: a player named Matt Handel scored $23,400 on the day after Steve Chernicoff’s big fifth win, and $23,000 two games later. Thanks for the nudge – updated. Hi, it’s Matt Handel. Thanks for the shout-out, Stefan. 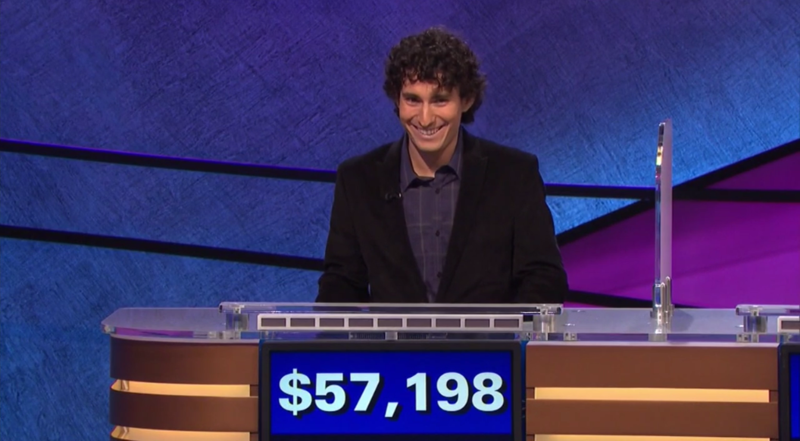 Day 1 was a lock, so I bet only $5,000 on a pre-Final Jeopardy score of $18,400. Day 3 was pretty wild: I was behind going into Final Jeopardy. I had $11,500 and my opponent had $12,000. I bet everything and got the question right. He bet the appropriate amount, wrote down the correct answer, and then CROSSED IT OUT to write in the incorrect answer. BTW, day 4 just stunk. I must have been tired–none of us cracked $10,000 during the game and all three of us got Final Jeopardy wrong. The winner that day took home $899. If you’re going to do a chart with all these colors in it, please explain what they mean! What does it mean when a contestant’s name is in green? Please forgive my ignorance but I do not understand your statement:”Also: at the request of Robert K S, I’ve marked scores that were unadjusted records at the time with a cross ✝.” What do you mean? They just hit 65,000 today! where is James Holzhauer’s 100k+ score? James Holzhauer not only has the #1 position at $110,914, but he also has the #2 position at $89,158.